The theory of personal intelligence is concerned at its core with understanding personality. Much of the theory’s language about personality and its depictions of personality are drawn from a unified framework for personality psychology called the Personality Systems Framework or PSF (Mayer, 1993; 2005; Mayer & Korogodsky, 2011; Mayer & Allen, 2013). The gradual unification of personality psychology over the past several decades has, in no small measure, made theories such as this one of personal intelligence possible. (For the historical background, see Old Versus New Personality Psychology). The Personality Systems Framework organizes the field of personality according to the above set of four topics, thereby cutting across theoretical boundaries. For instance, one of the topics involves identifying the key parts or components of personality. To do this, parts of personality from the various theoretical perspectives (mostly those of the early 20th century) were compared to one another and the best-established parts of personality, based on present-day research, such as “Extraversion,” or “mental models of another person” or “general intelligence,” were identified. These were usually the same parts of personality that psychologists regard as useful topics of study today. By focusing on the parts of personality themselves apart from the their theory of origin, the historical theories could be de-emphasized and a contemporary view emerged of which parts were considered important today. The Theory of Personal Intelligence draws on ideas about personality featured in the Personality Systems Framework including how personality is defined, personality’s location and its surrounding physical and social systems, and the particular parts of personality we give priority to when we think about ourselves and others. Personality psychology is the organized, developing system within the individual that represents the collective action of his or her motivational, emotional, cognitive, social-planning, and other psychological subsystems. (Mayer, 2005, p. 296). Figure 1: Positioning Personality Amidst Its Neighboring Systems. Figure reproduced with permission from Mayer & Korogodsky (2011, Figure 2, p. 107); developed from Mayer, 2005, Figure 1, p. 297. The vertical dimension of Figure 1 represents a bio-psycho-social continuum. 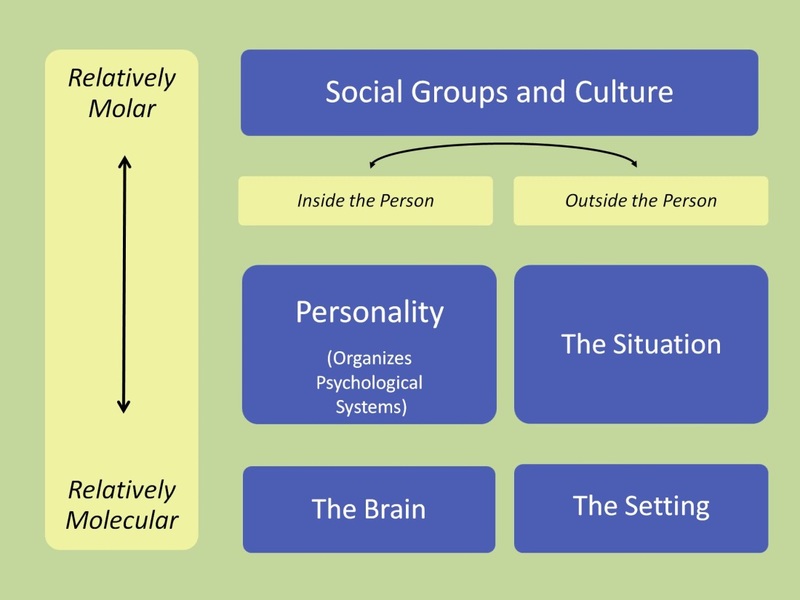 This vertical dimension distinguishes systems that are smaller (“molecular”) such as the brain and body (Figure 1, bottom) from the larger (“molar”) social systems that include families and societies (Figure 1, top). The individual’s psychology is in-between, emerging from the brain and contained within social groups. The horizontal dimension of Figure 1 distinguishes between systems inside versus outside the person. Personality’s location is inside the individual, emerging from the brain. By comparison our outer selves act in the external environment. Each of us is in a setting of some kind—in our kitchen or on a bus, at school or at work (Figure 1, lower right). Our setting impacts our behavior. For example, we wear jeans and a baseball cap to a baseball game, and wear business attire to work. The term “setting” is drawn from the theater, where a particular stage setting includes scenery, props, and related costumes. A given setting helps to define the way an actor will play her part—and how a person in a given place such as at school will behave (see Figure 1, bottom right). The basic elements of the setting combine to form a situation such as cooperating with teammates on a sports team, asking someone out to lunch, or feeding our cat (Figure 1, middle right). We act in a given situation according to its human meaning to us: we recognize that we are fixing the plumbing in the basement in one instance, or helping a neighbor with a yard sale in another. Personality is intimately involved with all of the systems around us—our body, setting, situations, and the groups to which we belong. Because we influence, and are influenced by, each area, we “give off” clues to our personalities all around us—clues that we use our personal intelligence to read. People who watch us can understand something about us by evaluating our settings (we often go out to eat at fast food restaurants), how we behave in situations (we are invariably polite), and the groups to which we belong (we sing in a barbershop quartet). We ourselves have access to our inner thoughts, which provides us with more clues as to who we are. (More about this is in Chapter 2 of the book, “Personal Intelligence”). In Chapters 3 and 4 of the book, I write of a toolbox model of understanding oneself and others. This model includes the basic methods we use to try to understand and to estimate what someone is like. Many of our estimates draw on our ability to identify and comprehend the key parts of personality, both in ourselves and in other people. For a bit more detail on the Personality Systems Framework, you can click over to the Personalitylab website at the University of New Hampshire. Derlega, V. J., Winstead, B.A., & Jones, W. H. (1991). Personality: Contemporary theory and research. Chicago: Nelson-Hall. Mayer, J. D. (2005). A tale of two visions: Can a new view of personality help integrate psychology? American Psychologist, 60, 294-307. Mayer, J. D. & Allen, J. L. (2013). A personality framework for the unification of psychology. Review of General Psychology, 17, 196-202. Mayer, J. D. & Korogodsky, M. (2011). A really big picture of personality. Personality and Social Psychology Compass, 5, 104-117. McAdams, D. P. (1990). The person: An introduction to personality psychology. New York: Harcourt Brace Jovanovich. Mendelsohn, G. A. (1993). It’s time to put theories of personality in their place, or Allport and Stagner got it right, why can’t we? In K. H. Craik & R. Hogan (Eds. ), Fifty years of personality psychology (pp. 103-115). New York: Plenum Press. Wheeler, D. (1994). Applying theories. Dialogue: The Newsletter of the Society for Personality and Social Psychology, 9, 8-9.